Hypromellose, or hydroxypropyl methylcellulose (say that five times fast), is a bit unique. Hypromellose is simply artificial tears that alleviate irritated or dry eyes. Dry eyes can occur when the body is unable to produce enough tears. The medical term for this condition is keratoconjunctivitis sicca. Another tongue twister, so we’ll just call it by its alternative name — Dry Eye Syndrome — for short. Common causes of decreased tear production include aging, certain medical conditions and medications, tear gland damage from inflammation or radiation, heating and air-conditioning, reading (particularly on an electronic screen) or exposure to the elements such as too much sun or wind. Dry eyes may sound like a minor complaint, but if you suffer from the condition, it can make your life miserable. Sufferers from dry eyes live with the constant feeling of dry, gritty and scratchy eyes that no amount of blinking or rubbing can alleviate. Natural tears are a complex blend of water, oil, mucus and more than 1,500 different proteins. Eyes produce three different types of tears, namely emotional tears, basal tears and reflex tears. Basal and reflex tears help to keep the eyes lubricated and prevent them from drying out. Basal tears form continuously to keep the eye lubricated, while reflex tears are produced when the eye is irritated, such as by wind, sand, sun or the interference of a foreign object. Both basal and reflex tears are designed to protect the eye. In a healthy eye, basal tears are secreted continuously to lubricate the eye while reflex tears appear only when a foreign object touches the eye, or the eye has been irritated by something. However, factors such as age, illness or medications can disrupt the normal functioning of the tear ducts. Tears are formed in three layers. The innermost layer consists mainly of water to keep the eye lubricated and moist. The middle layer contains proteins that are dissolved in water. This layer feeds the cornea (the lens) and conjunctiva (the white part of the eye). The outer layer is made up of oils that prevent tears from evaporating too quickly. Dry Eye Syndrome is the condition of suffering from dry eyes for an extended period of time. DES occurs when the innermost layer of tears does not produce enough water to keep the cornea lubricated, causing the eye to dry out. DES can also occur when the outer layer of tears does not produce enough oil to keep the tears from evaporating too quickly, leaving the eye dry. Moreover, it can occur from low tear production or when the body produces a low quality of tears as well, leading to insufficient lubrication and dry eyes. A number of factors can cause DES, ranging from changes in the environment and exposure to the elements to various medical conditions, medications, allergies and more. Certain medical conditions cause dry eyes, such as diabetes, herpes zoster, rosacea and auto-immune disorders like rheumatoid arthritis and lupus. Some medications such as beta-blockers, blood pressure medicines, anti-anxiety medication, sleeping pills and antihistamines are also potential causes of DES. Seasonal allergies are another major cause of dry eyes, along with laser eye surgery, wearing contact lenses and spending too much time in a dry or smoky environment. Chronic cases of dry eyes can affect your ability to focus on simple, everyday tasks. Your vision may become cloudy and your eyes may feel heavy, scratchy and gritty, as well as feeling extremely dry. You may have difficulty seeing at night and your eyes might become sensitive to light. Your eyes might water heavily at times, and then be completely dry at other times. They may sting, burn or itch, and contact lenses may be too uncomfortable to wear. Your eyes may even secrete a stringy mucus. Your eyelids could also become inflamed and painful. Even if you don’t suffer from DES, lubricating drops help to protect the eye from infection and injury, decrease the feelings of burning, itching, or feeling like you have something in your eye, and increase comfort levels. Many people can benefit from using hypromellose whether they suffer from dry eyes or not. Hydroxypropyl methylcellulose (HPMC) is a polymer, which is a large molecule with a long repeating chain made up of smaller molecules known as monomers. Proteins are made up of monomers known as amino acids. While in carbohydrates, the monomers are called monosaccharides — the most common one being glucose. DNA is an example of a polymer, made up of many monomers called nucleotides. Examples of man-made polymers include rubber, silly putty and plastic. Hydroxypropyl methylcellulose (HPMC) is a special kind of polymer that has the ability to absorb water and prevent evaporation, making it a key factor in keeping eyes lubricated and moist. HPMC is present in a wide variety of other products as well, including contact lenses, cosmetics and certain foods. It also has industrial uses, such as being used in adhesives, detergents and paint. Most people do not experience any serious side effects from using Hypromellose. However, some might feel minor short-term stinging, burning or irritation of the eyes immediately after application. This may also result in temporarily blurred vision. Moreover, eyelashes may stick together or become matted, but generally these side effects disappear quickly. Serious allergic reactions are very rare, but should you experience eye pain, redness or a change in vision, or have a severe reaction to the eye drops, seek immediate medical attention. You should consult your doctor before using Hypromellose if you wear soft contact lens or if you have ever had an allergic reaction to any of the preservatives found in the drops. 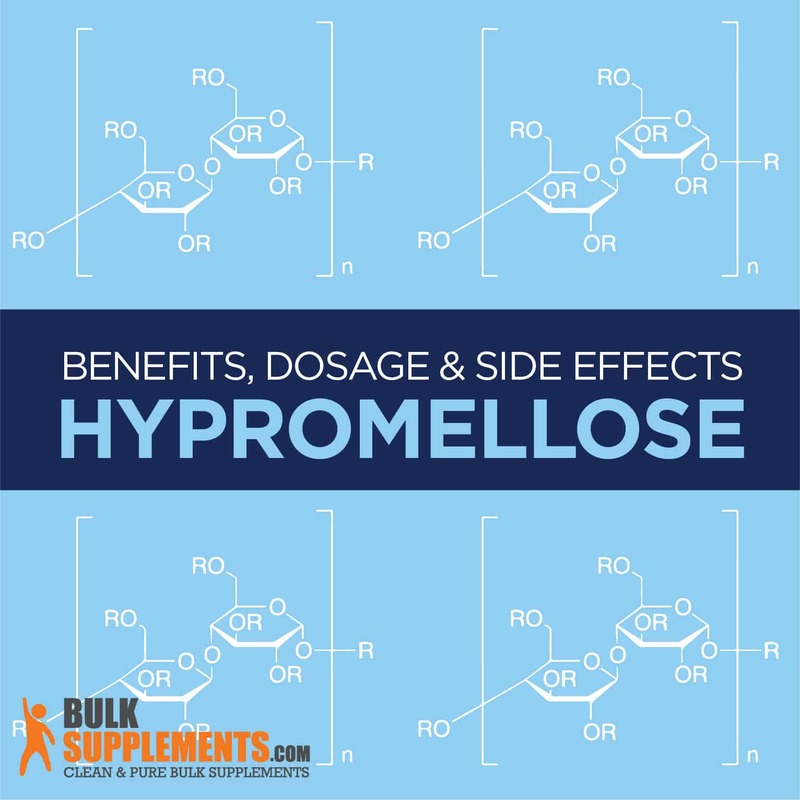 Hypromellose is available over the counter and is safe to use if applied correctly. To reduce the risk of eye infection, always wash your hands before using the product. Do not touch the applicator tip to any surface in or around the eye. Always keep the container tightly closed. Your dosage will vary and depend on the reason for needing the drops. For dry eyes, one drop 3-4 times a day is the usual recommendation.